These saints were two Roman martyrs who were wardens of St. Peter in the Mamertine prison and whom he converted and baptized. Their relics are in the porphyry urn under the altar. The mosaic above the altar depicts their martyrdom. In the center of the north transept is the altar of Sts. Processus and Martinian, from an original by Valentin Boulogne. The hemi-sphere has three roundels with Scenes from the life of St. Paul. The central altar is called after Sts. Processus and Martinian. 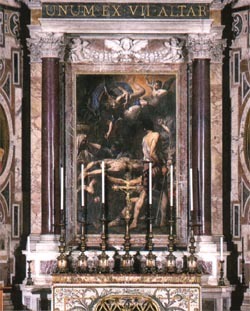 The mosaic altarpiece, after Jehan de Boulogne (Gianbologna) (1594-1632) portrays the martyrdom of the two saints jailed in the Mamertine Prison, converted and baptized by St. Peter. The two columns in giallo antico marble which flank the altar, are valuable and rare. The main altar is dedicated to Sts. Processo and Martiniano who, according to tradition, were St. Peter's jailers, who were converted and baptized by him. Their relics, originating in an apostolic era cemetery along the Via Aurelia, after being moved to various other locations, in 1605 were placed in the porphyry urn under the altar, which is flanked by two superb antique yellow columns. The depiction of the martyrdom of the two saints was executed in 1737 by the able mosaicist Fabio Cristofari from the original painting, now in the Vatican Pinacoteca, by Jean de Boulogne known as "Valentin," one of the major French followers of Caravaggio, from whom he assimilated the expressive realism and the dramatic contrasts in light and shade, giving them his own interpretation. Clement VIII planned to dedicate the chapel in honor of St. Paul, as can be ascertained from the stucco roundels in the vault, which illustrate scenes from te saint's life. The idea was never realized, however, and the altar in the north transept remained empty and untitled until, under Paul V, the bodies of Sts. Processus and Martinian were brought there from their altar in the old basilica. Processus and Martinian were imperial soldiers who, having been assigned the task of guarding Peter in the Mamertine prison in Rome, fell under the spell of his preaching and were converted. After being baptized, the converts were in turn arrested, beaten, and finally beheaded by order of the emperor Nero. Their bodies were buried in the catacombs of St. Agatha, on the Via Aurelia, where they remained until Paschal I (817-824) removed them for safekeeping to the Vatican basilica. Transplanted to St. Peter's, the cult of Processus and Martinian flourished. The altar of Sts. Processus and Martinian in the new basilica, like its predecessor in the old, is one of the seven privileged altars. Over the centuries the endowment established by Paschal I had been augmented by various wealthy donors, so that by the sixteenth century it generated sufficient income to support at least two priests, who earned their living by performing masses and other services at the altar. Valentin (the French artist) received the commission in May 1629 and completed the work in less than a year. He was paid a total of 350 scudi, which was less than Poussin but more than either Caroselli or Spadarino were paid for paintings of comparable size. 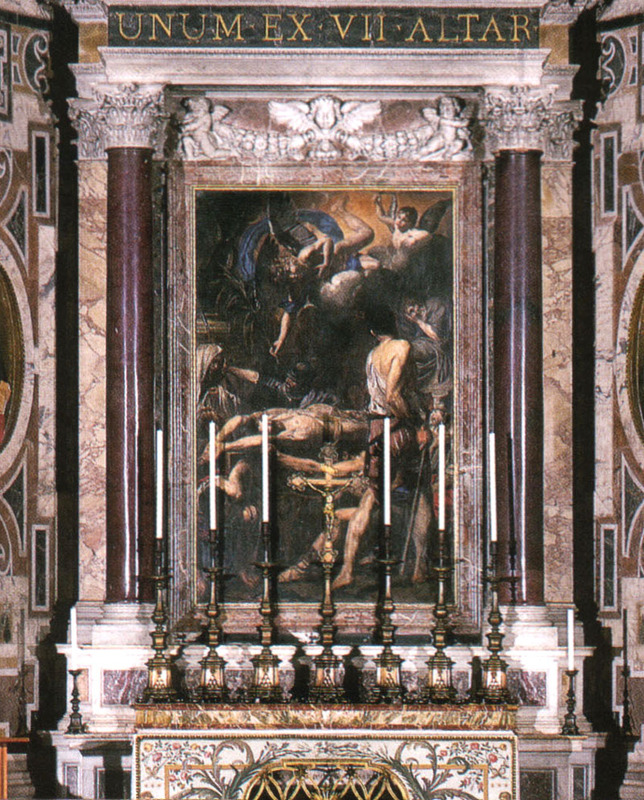 The altarpiece represents the martyrdom or, more accurately, since their martyrdom was by decapitation, the torture of Sts. Processus and Martinian. The saints are stretched out head-to-foot on a rack. One torturer turns a crank to increase the tension; another heats metal pokers in the coals; a third prepares to beat the martyrs with a rod. As though the brutality of these executioners defies pictorial expression, Valentin had hidden their faces from view, either turning them away or casting them in shadow. Several soldiers are in attendance, their presence a poignant reminder that the men on the rack were once their comrades; Processus and Martinian too were once soldiers of Caesar, but now they are soldiers of Christ. On the left, a veiled woman watches with a gentle and sorrowful expression; on the right a raised throne, a bearded man, wearing a toga suggestive of authority, clutches his right eye with one arm while pointing with the other toward a statue of Jupiter. Angels descend on clouds, bringing palms of martyrdom. Valentin has tried to include a great many narrative elements in a relatively small field, with the result that his composition is somewhat crowded and confused. The painting has darkened considerably over time, and the colors have changed. This we can tell by comparing the canvas in the Vatican Pinacoteca with the mosaic replica which stands over the altar in the basilica. The altar of Sts. Processus and Martinian was consecrated in 1628. 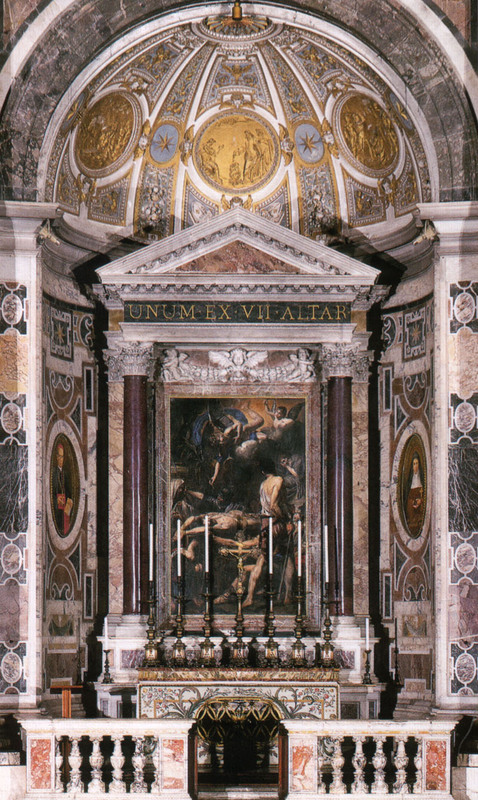 Valentin's altarpiece was installed in 1630 and remained in St. Peter's for about a hundred years until, in the early eighteenth century, it was replaced by a mosaic replica. The original altarpiece by Valentin de Boulogne, now in the Vatican Picture Gallery, was painted in 1629-30. Filippo Cocchi received the commission for the mosaic on 24 July 1709, but the initial payment for his work was recorded only in February 1710. On 30 September 1711, the Congregazione della Reverenda Fabbrica noted that he was still working on it, and that it would be finished in less than two years. At different times from 1727 to 1737, Liborio Fattori, Giovan Battista Brughi, and Pietro Paolo Cristofari worked on the altarpiece. However, whether they were involved with completing or restoring the piece is unclear.